Starting in October, the CLUB Teen Center underwent a new structure to programming and operations. The goal was to create a daily schedule that included at least one program a night with a variety of choices to keep teens engaged and keep the teen center fresh with new activities for youth to participate in every day. With an hour by hour program schedule, teens know in advance what is happening each day, and are able to choose what programs they want to participate in based on their needs and interests. Some of the programs currently being run include Career Launch, Boys II Men, Keystone, Book Club, Rocket Math and an experimental run of the worldwide gaming sensation Fortnite on Thursday nights. In a trial run on an early release Wednesday, we created a waffle bar for the teens when they arrived from school and it was a complete hit! 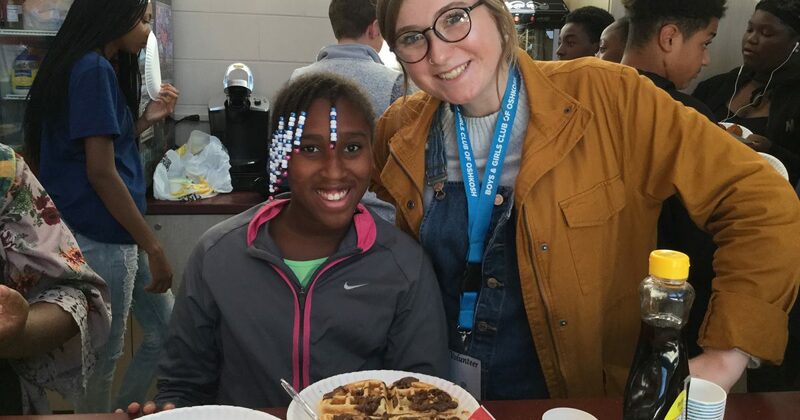 With so much positive feedback from the teens, we decided to continue “Waffle Wednesdays” on their early release days from school! Programs starting in the near future include Smart Girls, indoor kayaking clinics, a step dance team and our Teens 2 Work program. In addition to the above programs, girl’s volleyball exceeded expectations this season with around 13 teen girls participating in practices and in games against area clubs. The girls ended the volleyball season undefeated! Boys basketball practice has begun drawing many of our teen boys to practice in hopes of bettering their skills, learning to work as a team and coming home with more wins this season than last year. Thursday and Friday nights continue to be our middle school and teen nights starting at 6:00 p.m. where we include fun activities, games and food to make those nights just a little more special for our middle school and teen members. The past few months, teens have taken trips to the Burial Chamber Haunted House in Neenah for Halloween, cheered on the Wisconsin Herd at a few of their home games, went to the movies, participated in a “Chopped” competition and helped out in the Oshkosh Holiday Parade. With a wide variety of programs and activities, average daily teen attendance has increased to around 40-50 teens a night, with new faces entering the building throughout the week. With more members attending Club, our teen center staff team has increased as well with new youth development professionals bringing a new array of interests and strengths to the teen center. With the new year soon upon us, the CLUB Teen Center team is looking forward to even more programs, trips and activities for the teens to enjoy and continuing to increase our daily teen attendance.